2002: Roosevelt Hospital has been listed on the New Jersey and National Registers of Historic Places! 1/2004: Middlesex County has decided to rehabilitate the original portion of the hospital as a nursing home and demolish the 1960’s addition on the south side of the building. 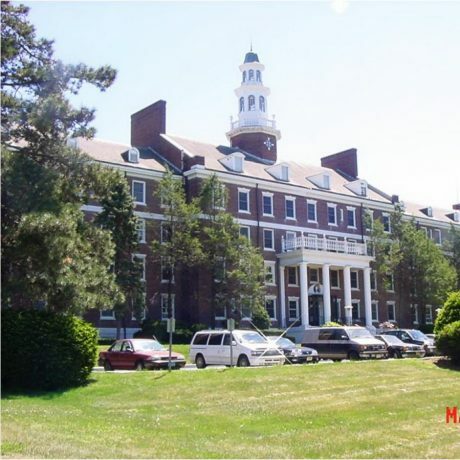 9/2012: Middlesex County is seeking state funding to rehabilitate historic Roosevelt Hospital for use as senior housing. They are pushing the municipality of Edison to designate the property as an “area in need of redevelopment” in order to take advantage of low-income housing tax credits offered via the New Jersey Housing and Mortgage Finance Agency. Built during the Great Depression with Federal financing as the Middlesex County Tuberculosis Sanitorium, this massive four-story, Colonial Revival structure is built of red brick with limestone trim. Situated on a majestic hill overlooking a picturesque park, it has a large two-story entry porch and a grand 46-foot high center cupola. Today, Roosevelt Hospital stands as a grand monument to the New Deal, to the history of public health efforts, and to the era when tuberculosis was a menace. The building remained a tuberculosis hospital until the 1950s when antibiotics decreased the ferocity of the disease, after which the hospital became a long-term health care facility. The hospital has seen two major additions over the years: in 1963, a 100-bed section was added for long-term care and outpatient treatment, and in 1982, and additional 250-bed section brought the hospital to its present capacity of over 500 beds. During the recent years, Roosevelt Hospital has been losing money, and Middlesex County officials have been negotiating to sell the property to a heathcare facility operator who wants to replce the hospital with two new 180-bed nursing homes. A group of interested local citizens is trying to save the building from demolition, but the County has vowed to proceed with its intention to sell the property.